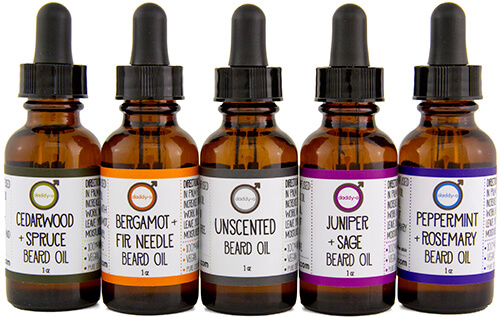 Our NEW Beard Oil is packed with nourishing oils that will leave any length of beard conditioned and manageable and your skin feeling soft and moisturized. The main ingredient in our beard oil is jojoba oil infused with rosemary herb. It imparts shine to your hair, while deeply moisturizing your skin. Jojoba oil is a liquid wax that mimics your skins natural oils, making it great for all skin types. Rosemary is known to increase blood flow to the skin, encouraging hair growth and leaving your beard thick and healthy. Our oil blend is enriched with safflower and sweet almond oils plus an extra touch of vitamin E. Safflower oil known to calm irritation and give the skin a healthy glow, while Sweet Almond oil is softening and conditioning to both the skin and the hair, leaving your beard touchably soft. Vitamin E is a natural preservative for oils and gives an extra antioxidant boost. Our beard oils are packaged in an amber glass bottle (which helps preserve the oils and increase shelf life) and has a dropper lid for easy application.